Learn how to use our Subtraction with Regrouping Worksheet Video. 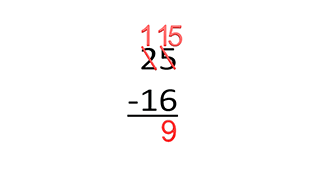 In our Subtraction with Regrouping worksheet video your kids can see two problems worked from our worksheet. The video is there to help and I made this page to explain how to use it in the classroom. First off I realize that many classes will not want to use the worksheet. I am not the best at making worksheets but due to funds I had to be the one making them. To use the video you do not need to use the worksheet and that is the beauty of the video. The video is short enough to show in the classroom and have the kids work the problem as the video starts. The amazing thing to do if you have a projector is project it on the classroom whiteboard and the kids can work the problem as it is projected. They can then finish the video and see if they got the problem correct and lots of praise given will help cement the fun. Subtraction with regrouping can be difficult because we spend lots of time teaching about place value and how the ones stay in the ones place and such. With regrouping and subtraction we teach the kids to put more than ten ones back in the ones place or the tens place and subtract from there. This concept can be hard but we have one longer video teaching the concept and the new worksheet video. I hope you enjoy the video and it helps your kids learn. Click the button to watch the video.